Maxwell Darwin Perkins stands atop the concrete steps at Grand Park—a strip of green space tucked between skyscrapers in Downtown Los Angeles— wielding two lightsabers. He learned his moves from his friend Kung Flow, a professional lightsaber trainer. “I’ve been training three months for this,” the 25-year-old says, referencing the large lightsaber battle about to take place. The first Star Wars film (or fourth, depending how you’re counting) premiered 40 years ago, and every subsequent release in the franchise has been the largest blockbuster event of its given year — including this weekend’s The Last Jedi, which several hundred L.A. Star Wars fans are celebrating by staging a mock battle between Jedi (the good guys) and Sith (the bad). Across the park, the night sky is illuminated by the neon hue of red, green, blue and purple lightsabers whirring through the air. The people brandishing them range in age from 5 to 50 — dads in full Kylo Ren regalia; moms cosplaying as Emperor Palpatine; boys dressed as Obi-Wan Kenobi; and at least a dozen girls in Rey costumes. 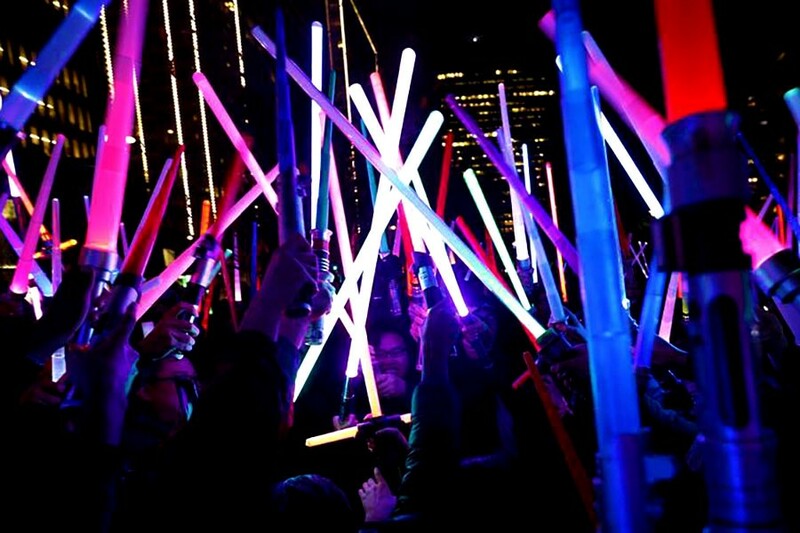 The gathering technically isn’t a lightsaber battle at all, but a stop on The Glow Battle Tour, a charitable organization that raises money by staging such events across the country. (Tonight’s proceeds will go to the victims of the Oakland warehouse fire.) The Glow Battle Tour presumably took its name to avoid the wrath of Lucasfilm and Disney, the notoriously litigious keepers of the Star Wars franchise. But the distance from the Star Wars universe is purely superficial — everyone refers to their weapon as a lightsaber. The official event doesn’t start until 9 p.m., but attendees waste no time, organizing duels of their own. A circle forms around a red-bearded man in a custom Jedi costume — a green tunic, adorned with brown leather patches. He spins his dual-bladed lightsaber and fends off hordes of challengers. Lightsaber battles can be classified as LARPing (“live action role play”), with some of the more serious warriors adhering to a strict set of rules. An African-American woman in a “REBEL SCUM” T-shirt gets her left hand “sliced,” and reflexively places it behind her back. Her opponent gets her leg on the next pass, rendering her immobile. Then, the final blow — a strike to her chest. Others ascribe to a point system similar to the one used in fencing. For the most part, though, the battles are unstructured and child-like. Twenty-four-year-old Bryn Kirsch squares off against his younger brother, Quinn — Bryn assuming the role of the righteous hero with a red cloak and a blue lightsaber, and Quinn in a black cloak, playing an evil Sith lord. Midway through their battle, their showdown shifts to a recreation of the famous lightsaber battle between Anakin Skywalker and young Obi-Wan Kenobi. “Don’t try it, Anakin!” Bryn says, channeling Obi-Wan. And true to canon, he slices Anakin (his younger brother) to pieces shortly thereafter. Away from the battle, two blond women in their 30s, sit slumped against a slab of marble. “Me,” replies her friend — Florentina Pralgauskaite, a 31-year-old therapist. It’s nearly 9 o’clock, and one of the event organizers walks the premises with a crutch and a Rebel Alliance T-shirt, speaking into a small bullhorn and herding attendees to the east end of the park for the main battle. “It’s about to start!” he announces. He instructs players to their respective sides of the park’s grassy clearing — Jedis to the north, Sith to the south. The crowd parts, the Jedi side forming a phalanx of green and blue lightsabers, and the Sith identifiable by the menacing glow of their distinctive red blades. Teams are unassigned. Participants are free to choose their allegiance, and the number of Star Wars fans who actively choose to play as a Sith is about half as large. “Je-di! Je-di! Je-di!” chants the one side. “Sith! Sith! Sith!” their opponents answer. The organizer barks into the bullhorn again, and the two sides converge upon each other in the middle, creating a wild scrum of flailing lights, City Hall looming auspiciously in the background. The clash is gentle and friendly, though. There’s nothing at stake except pride and camaraderie. Eventually, the scrum dissipates, with Jedi and Sith warriors breaking off and forming their own fight circles and staging one-on-one duels between friends. Pralgauskaite and Westberry walk around the perimeter, sneaking up on people engaged in battles and stabbing them from behind, claiming victory. A man marvels at his friend’s lightsaber. “Whoa! Your saber is so fast, man,” remarking on light it is. While many of the attendees rent their lightsabers from the Glow Battle organization for 10 bucks a pop, the more dedicated Jedi knights bring their own. A man stops Pralgauskaite and Westberry to show off his custom-made weapon from UltraSabers, a maker of high-end lightsabers. “I got a deal, so it only cost me $300, but I got about another $50 of special features added to it,” he tells them. The handle is made from real metal and has considerable heft, and the shaft is considerably brighter than most everyone else’s. Sixteen-year-old Caroline Wreszin also watches from the sideline. A cross-country runner at nearby Flintridge Preparatory high school, she suffered a stress fracture in her right foot recently and can’t partake in the battle. But she agreed to accompany her cousin, a diehard Star Wars, fan before she suffered the injury. Now she watches with bemused awe at the hundreds of people who’ve come out on a Friday night to play out their Star Wars fantasies.